Students will create and maintain an ongoing journal devoted to their growing understanding of radiation. Radiation is a word used and misused frequently - students must come to grips with what we truly mean when we use it. As a backdrop to today's lesson, it is important to know that we have missed two of the last three classes because of snow days. Today's work is meant to get my students back on track with our study of waves and electromagnetic energy. During the warmup, we practice manipulating wave mathematics (HS-PS4-1) while the journal-writing exercise moves us along on our ability to assess the health risks of electromagnetic exposure (HS-PS4-4) and develop our understanding of the nature of electromagnetic transmission (HS-PS4-3). These standards may be viewed in full here. I pose the following warmup problems along with a strong recommendation to students to dig back into their notes. As we have lost two recent class periods, I simply want students to locate their resources (valuable ideas and equations in their notes) and apply them. After about five minutes, I reveal the solutions and discuss some of the implications. For example, given the frequency of this wave (290,000 Hz) I suggest that there is nothing that a human can do at this rate. For an electromagnetic wave, however, this is a relatively low frequency. And, given the velocity information embedded in the warmup, we are to assume that this is, indeed, an electromagnetic wave. This conversation erupted into a series of interesting questions about radio wave transmission and other related topics. I elaborate on the nature of this segment of class in a related reflection but note here that we ran well past the intended time-frame. As a transition to the launch of a journal-writing exercise, I ask my students to locate their responses to an "exit ticket" question from a few class periods ago. I put the exit ticket question on the board as a reminder, and those who could not locate it formulate a response in the moment. For a few minutes I take responses to the question from students. Many nominate the amplitude as a key characteristic but others believe the key is frequency. Without any hint of a right answer, I facilitate the conversation and help students articulate their answers with some precision. For example, to the student who said "the wavelength has an amplitude" I push back until he is able to say "the WAVE has an amplitude . . . and that's the link to energy." In addition, I press students to provide examples where, for instance, altering the amplitude would change the energy of a wave. By doing so, the conversation is enriched with students' mental models of how waves carry energy. I use this time to orient students to one of several "starting points" for a radiation journal assignment which is introduced in the next section. 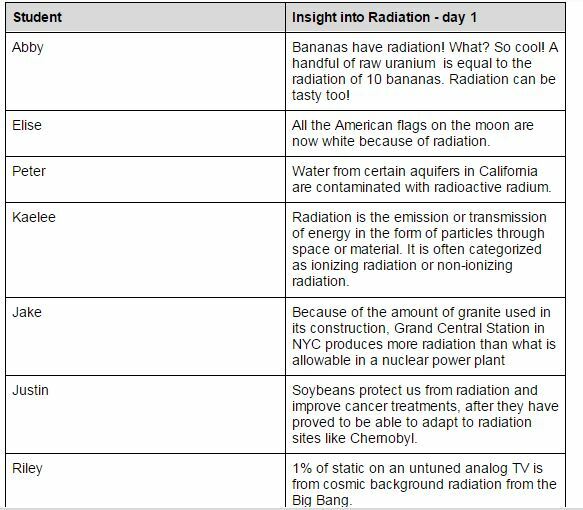 The journal is a way for students to demonstrate their growth of understanding of the topic of radiation. I distribute a description of the radiation journal assignment to the students and ask them to read it quietly for a few minutes. After reading, I stress to students that this journal's purpose is to record their developing thoughts about radiation and that early entries should not be edited. This is hard for some students as their comfort with being "wrong" is quite low. This assignment can challenge some students' thinking about learning; those who carry a fixed mindset about intelligence can have a hard time accepting the growth model that is embedded in this assignment. There are several bold-faced items in the radiation journal handout. In addition to the exit ticket, students are prompted to find the Three Common Key Questions and their response to the 3-2-1 health hazards activity. These items are the starting points for all students. They begin their journal with these entries, with answers transferred from their notebooks to an electronic journal which is shared with me. From there they are free to research the concept of radiation, with the Three Common Key Questions as their driving questions. With about ten minutes to go in class, we transition to one last activity. In the final segment of class we review the differences between mechanical and electromagnetic waves. In the final few minutes before class ends, I distribute a sheet of notes comparing the traits of mechanical and electromagnetic waves. Students follow along and ask questions as I elaborate on some items. Given the time frame, this is not meant to be an exhaustive discussion of this rich topic. It is merely an introduction to the differences and the sheet itself is meant to be a reference for later lessons. I strategically leave off the topic of wave energy as I wish for that to emerge in a conversation that is rooted in the wave-particle duality of electromagnetic waves.